Equipment - The pro's equipment -discussion and questions! The pro's equipment -discussion and questions! Topic: The pro's equipment -discussion and questions! Subject: The pro's equipment -discussion and questions! Together with Alex I have decided to start a thread to gather all questions, and discussions, about the pro's equipment! 1. All off topic will be deleted, or moved out in separate topics. 2. All new topics posted with questions about the pro's equipment will be moved into this one! I have put in a few pro's that I know, and I will keep this first post updated with a list of the pro's and their equipment. I will do alphabetically after their last name. Here you are, the new updated list. Correct any errors i have made. R- Racket, F-Forehand, B- Backhand, First name/last name, country, and handle shape. Cool! What about female players? I have updated the first post, and will include both male and female players in the list. Now I know that we have a thread for both male and female pro's equipment already, but the reason I'm doing this ks that both threads contain what the players used before the glue ban. Arylate-carbon blade (probably TBS) with Baum Carrera Senso handle. Custom blade based on the Korbel Magic Hand with two glass fiber plies. Looks more like a Kevtech/Carbokev to me? I don't really trust Stiga's (or any other companies) website. What's the diff between normal H3 neo and H3 neo blue sponge? One of them is probably a bit harder than the other. Could be other differences to, but I'm not sure.. Does anyone know what Christophe Legout is using? It's some sort of Tenergy, and the blade is supposedly TBS, but that just doesn't seem right..
Schalger, note that Hoyama and Matsumoto are J-penholders. They use only one rubber. Wang Liqin has carbon blade? Moved it into this topic, gariklokin.. It does look like a carbon mix, possibly arylate/carbon? Edit: Found a picture of Xu Xin's racket, and that backhand rubber is certainly not Tenergy. Also Chuang Chih-Yuan's racket which seems to be some sort of custom BTY blade with Tenergy 64 on the red side, and some type of Tenergy on the black side. Hugo Hoyama uses one rubber only. Same as Cazuo Matsumoto who was using some chinese rubber a few months ago. Updated the first post with some posts that I must have missed..
IceObsession: Thanks for listing it up like that! So much faster to just copy them straight in! Moved it into this topic, gariklokin..It does look like a carbon mix, possibly arylate/carbon? Edit: Found a picture of Xu Xin's racket, and that backhand rubber is certainly not Tenergy.Also Chuang Chih-Yuan's racket which seems to be some sort of custom BTY blade with Tenergy 64 on the red side, and some type of Tenergy on the black side. The picture that I captured during Kuwait open shows that he is using an orange sponge. I've read from somewhere that it is a thicker version of Sriver EL. I know it is hard to believe. :))) maybe only handle is new? maybe only handle is new? Who knows what Wang Jian Jun equipment is at the moment? Still Stiga OC? The picture with the white sponge was uploaded 4 days ago.. So I changed Xu Xin's backhand rubber to simply "Unknown"
The picture with the white sponge was uploaded 4 days ago.. So I changed Xu Xin's backhand rubber to simply "Unknown"
"uploaded"?, but when was it captured? mine was captured during Kuwait open. Doesn't look like the same blade to me.. It was uploaded to http://www.fotop.net/rxng/cntt/ - http://www.fotop.net/rxng/cntt/ 4, now 5, days ago. The Kuwait open was over 2 months ago, so it's not unlikely that he has changed his bh since then..
Also the one he is using has a metal badge, does not have the blue lines across the handle and also has carbon layers of some kind. For me looks like a custom made that they put TB Spark handle without any lens..
TB Spark is only Arylate and this one looks like A/C. most of the top 20 player are using pure wood blade. Including Ma long and Timo. You would say "hey, but I see Ma's handle is Timo Boll Spirit!!" will have to have a extremely stable blade. Give them a blade bought from stationary, glued with Tenergy. Believe me, when they do a drive, u still touch nothing. I am sure that i have seen the blue colored ALC layers on Timo Boll's blade in one of the videos. Though i am very sure that you are correct about what you have said above, i just don't believe that they are using an all wood blade. You should substantiate your verdict with pics to make all of us believe. Both have layers of Arylate/Carbon. Speed is not everything. Suppose all the pros are able to hit so powerful drives but then the they still can use carbon or ALC blades because if its already fast then they have to show that they are able to handle the speed in slow shot or they will be just like us, power but no control is nothing. Besides, Ma Long if he uses ALC, its possibly for the dead feeling ( little vibration ) that he wants. Looks like the most popular BH rubber is: "unknown"
Where can i get a sheet? Doesn't Zhang Jike use Bryce speed in his backhand? I've always known it but can't confirm the source now. I was watching some videos on dttl , anyone know why Timo is using red rubber on his FH? He changed his rubbers? Kishikawa now uses red rubber on his FH too, in smash he change to black side to smash. Would this be too much to ask to list thickness of the sponge if known? He is saying there aren't any blk t05 of a certain weight. I wonder what weight he is looking for... and gets! Before Butterfly made the Schlager Carbon, Werner was playing the Primorac Carbon. In order for the Schlager Carbon to be different from the Primorac Carbon, Butterfly produced the Schlager Carbon blade with a slightly thicker inner ply. This of course brought the weight up. Werner likes his blades to be exactly 91 grams and the Primorac Carbon is exactly 91 grams while the Schlager Carbon is 95 - 96 grams. So, in order for him to play with a blade with his name on, they actually put Schlager Carbon handles on a Primorac Carbon for him..
For someone at a sub world class level, I doubt that they would even notice the difference between the Primorac an Schlager Carbon blade.. They are basically identical except for the inner ply which is only slightly thicker on the Schlager Carbon.. He does NOT have a special made blade (other than the handle with his name).. It actually is a off the shelf Primorac Carbon with only the handle being difference.. His rubbers (Tenergy 05) are also off the shelf Tenergy 05 rubbers..
Pushblocker, how do you know all these things about Schlager? He kidnapped Schlager and forced Werner to play TT in his garage. Actually if you read through the thread you will find they were school friends at a young age and Schalger stopped to visit Pushblocker for a few days when he came to the US for a Killerspin event. Butterfly claims that uses Primorac Carbon, Tenergy 05 and Tenergy 64. Do you know which Tenergy uses on f/h? Edit: I moved this in from a separate thread. The question was about Daniela Dodean. I've talked to her doubles partner, Elizabeta Samara and said she plays with Tenergy 64 both sides on a Primorac carbon. So Werner Schlager plays Primorac Carbon with Schlager handle. I have changed Zhang Jike's bh to Bryce Speed. I'm also pretty certain that's what he uses, but I can't remember where I saw it. IceObsession: Again, thank you so much! Updated the first post with more female players! i thought he used t64 now....you could see it in those close up pictures...or at least some kind of tenergy. 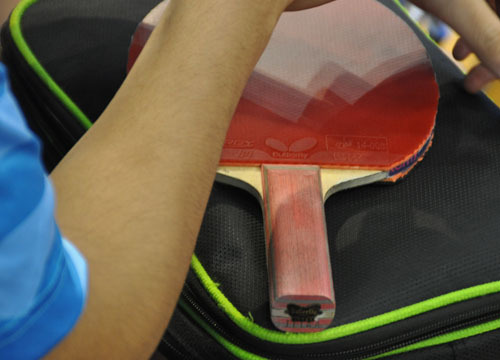 The picture showing a white sponge and a BTY logo was old, and all pictures from the ITTF from 2010 shows an orange/red sponge. Tenergy 64 is more likely than both 05 and 25, so I'll put down T64. You are not talking too much, 4 posts in 6 years ! Well, been kind of busy and I just happened to be asking Elizabeta the same question about a month ago. Does anyone know what set up (CPen) Wang Jian Jun has. He uses a Yasaka Ma Lin Extra Offensive with Tenergy of some sort on his fh (probably 05) and some orange or orange/red sponged rubber on his bh..
Werner and I have been best friends since High School.. I grew up in Austria and moved to the US 13 years ago.. Werner was visiting me in December before he went up to Chicago to play at the Spinvitational. When we played in my garage, I asked him if he played a off the shelf Schlager Carbon and he told me that it's a off the shelf Primorac Carbon with a Schlager handle and that the difference between both blades is that the center ply is thicker on the Schlager Carbon and that this brings the weight to 95 - 96 grams and that he likes his blades exactly 91 grams. I was actually surprised when he told me that it was actually basically a off the shelf blade (even though not really a Schlager Carbon).. I know that he would have the option that Butterfly makes a blade specifically for him. Some Pro's do NOT play off the shelf blades like Werner does. His blade (except for the grip) is no different than what anybody else plays if they get a Primorac Carbon from Butterfly.. Again, the difference to the Schlager Carbon is mostly the extra weight. Most Pro's are VERY specific when it comes to blade weight..
Congratulations to Butterfly for its quality control. Even Werner Schlager uses commercial Butterfly products, off the shelf. I've used Butterfly blades and long pips rubbers before and the long pips lasted for 10 years.. Long Pips of other brands often start losing pips after 20 - 30 hours of play.. Butterfly definetely makes quality products! I also have pretty good experience with TSP products. Japanese quality is definetely better than chinese quality.. However, you can buy a lot more chinese equipment for the same money than japanese equipment..
Too bad that Butterfly doesn't make a slow long pips blocking rubber.. Their long pips are more geared towards choppers and not blockers.. I'm impressed by member_profile.asp?PF=10328&FID=24 - Schlager 's dedication to this Topic. It might take a day or two for me to update the list right now. Got both moving and exams going on right now, but I'll try my best to keep it up! Does anyone know which blade Christian S�ss is using btw? And if he has changed his Tenergy's? I think I saw some Tenergy looking sponge on Tugwell's racket, and a Clipper of some sort on Smirnov's racket. afaik S�ss plays with a Boll Spirit, rubbers are still Tenergy05. Ovtcharov's black (forehand) rubber is a tenergy aswell (didnt see exactly which one), his red bh rubber is a donic. when he is smashing the ball, he is changing to his red rubber! smirnov with clipper + 2x Tenergy, got a picture from the ittf screen when his racket was laying on the table, you could see the tenergy sponge. timo still with tenergy and alc but probably not that happy right now: after missing a shot vs. mizutani in the 5th set (the point from 8:7 to 8:8) he is shouting "Schei� Bel�ge" -> "f*cking rubbers"
From Moscow, Petr Korbel seems to have switched back to his old Korbel OFF (5-ply) blade and uses some kind of Tenergy on both sides. I'm assuming its T05 since that was what he used before. do you know skachkov's rubber?blade? Pretty sure he was using Donic Coppa Speed although he may have moved onto one of their new rubbers, Acuda perhaps? do you know the set up of wu jiaduo,patrick franziska,floritz? what equipment WANG Yuegu uses. i dont know what wu jiaduo is playing, sorry. Feng Tianwei`s blade is Stiga Tube Carbo. Feng Tianwei was using the Tube Carbo! Doesn't he use an Andro blade? From what I saw at this WTTC he wasn't playing with Boll Spirit. Maybe I'm wrong?! was timo still using tenergy 05 on the black side? The sponge on the black seemed different than that on the red side, and he was using red for his FH...maybe he gave t05 fx a shot? Is there an online catalog for this equipment. I'll keep looking around here. Thanks. Look at 10:07 minute against Ma Long. Timo's black rubber is definitely not T05. The sponge is like Bryce Speed's or similar or something else. What's the sponge color of T05 FX? Doesn't he use� an Andro blade? From what I saw at this WTTC he wasn't playing� with Boll Spirit. Maybe I'm wrong?! Have you tried Donic Akkadi? Don't know much about it other than that Fabian Akerstrom (World's top frictionless long pimple players) is using that rubber. Not as good as the old Hallmark Original rubber (of course!) he used to use but he did say that he'd been using the same rubber for over a year... I remember the old ones randomly losing pips pretty quickly. I did some filming with him at the Worlds Champs that just finished and I'll be making some videos in the not too distant future. One sponge is red (Tenergy) and the other is not red. How can you say that are both Tenergys? Edit: Picture by courtesy of the ITTF. She has used the Stiga Kevlar for some time, but this looks more like a tube carbo to me! There is a better view of it in the match against Ding Ning, as mentioned earlier! OK, you're right, I was looking to TBS instead of ALC. Sorry! 1) I saw Feng Tianwei using some Stiga blade with the '' Tube '' written on the handle during the match. looks like Liu Shiwen is using korbel fl... anyone knows wat rubber she uses? ...2) Why do the players have to be so specific about the weight of the blade?...does a 92gr blade feel different from a 91gr?